Deborah Vella is the definition of a modern, entrepreneurial lawyer. Deborah runs her innovative legal practice, Support Legal, from home around the needs of her young family. She founded Support Legal at the start of 2017. From the outset, Deborah was determined to create a legal practice that supports Australian small businesses by providing valuable legal solutions that were affordable, efficient and effective. Deborah believed that the best way to achieve this goal was to have quality legal documents that small businesses could access directly without legal advice. She also wants to help redefine how legal professionals and non-legal professional advisors could provide efficient and effective services to their own small business clients. Support Legal would also need to provide a supportive working environment to support her (and, in the future, her team) to maintain an ideal work and family lifestyle. Deborah has found that there aren’t many lawyer jobs out there that support the family lifestyle - many firms claim they offer flexible and alternative working arrangements but in reality there are a number of factors entrenched in traditional legal practice which make it difficult for working parents. Deborah also envisaged providing a service that ‘Big Law’ could not. Deborah wanted to be able to remotely ‘pop in and out’ of her clients’ businesses as required and to be able to turn work around for clients much more quickly. Working largely online allows her to do that. After establishing Support Legal, Deborah soon realised that small businesses were generally very reluctant to work with a lawyer. Deborah knew that small businesses would benefit from receiving affordable advice on an ongoing basis and properly documenting their business dealings. Deborah started looking for an automation solution that would enable her to provide the best legal solutions at an affordable price. It was around the time Deborah was looking for a software solution that she read about Automio. Not only did Automio provide everything Deborah was looking for, it was easy to use so Deborah can build the automation of her documents herself. 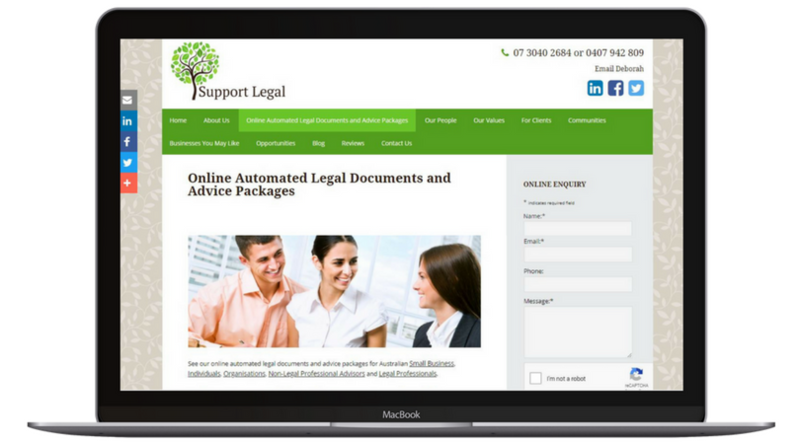 Deborah does provide legal advice directly, although her focus is increasingly on providing her clients with customised, quality automated legal documents. One and a half years in, Deborah says her business is growing fast and she receives wonderful feedback. Deborah provides legal documents that meet small businesses’ needs. Using Automio, customers can complete an online interview and instantly receive a document with the appropriate clauses selected and tailored based on the customer’s responses. If a customer would like legal advice, they simply send the Word version of the document to their own lawyer to make any necessary changes specific to their business. Of course, many small business owners don’t know exactly what documents they need. Traditionally, they would have avoided speaking to a lawyer - remember, many small business owners would perceive lawyers as delivering expensive documents that are difficult to use. Now, they can obtain customised, quality legal documents at an affordable price and only obtain the legal advice that they actually need. And when asked what Deborah gets with the time she saves with Automio? “They also have more time to regularly connect with clients to look after their legal needs on an ongoing basis.” Deborah’s customers are then able to offer their clients legal advice services that prove useful in their businesses. Selling these documents to other legal professionals also gives Deborah an additional revenue stream – one that doesn’t require a significant amount of ongoing time and effort. Once Deborah has built the automation of a document, the hard work is largely done. Although Deborah is happy to talk through the curly questions, she says that Support Legal’s documents are designed to be easy to understand and use by each and every customer, regardless of the customer’s background. Once Deborah has drafted a functional, plain English master document, Automio helps her ensure that classic lawyer clichés don’t slip back into the documents that go to customers. Even in firms that have well-drafted, client friendly precedents, lawyers respond to stress and tight timeframes with unwieldy language and terms of art. Automio’s automated workflows, on the other hand, don’t get verbose under pressure. A shift in the legal industry from billable hours to a focus on client service and outcomes achieved has provided Deborah with opportunities to grow her business in the long term. 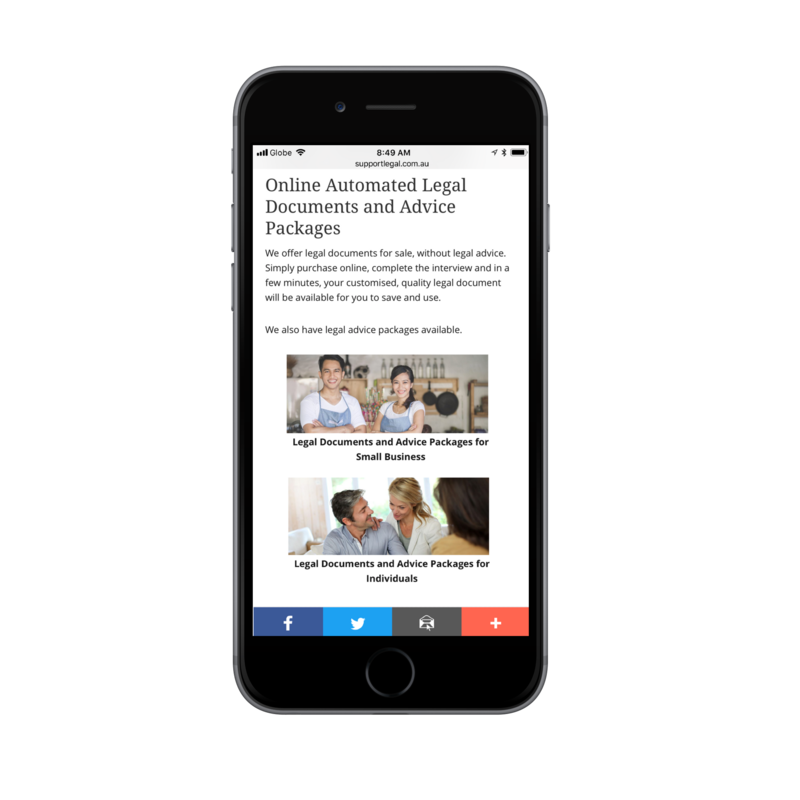 Using the Automio platform, Deborah is growing Support Legal into an efficient, modern practice that meets the needs of small businesses. And Deborah has done this without a bunch of staff or working long hours and sacrificing time with her family. Deborah is also making valuable connections with other legal professionals who are embracing widespread change in the legal industry. You can choose Automio to free you from the weight of repetitive legal tasks, so you can spend your time on the work you love. Discover how Automio frees you from the drain of repetitive legal tasks.